You've no doubt heard the expression "rare as hen's teeth" and not given it a second thought. In the unlikely event you have pondered it any further, maybe you concluded: "they obviously don't need teeth if they're just eating grain, worms and the like," or simply, "if they needed teeth they would have evolved to have teeth and not just beaks" - valid points, and true to a degree. Well their Archosaur ancestors did have teeth but, for one reason or another, they evolved to become the creatures we know today. And, while they may not have teeth, they do have a digestive system that gets around the problem in an pretty ingenious way. Because, while chickens that just eat grain are perfectly capable of digesting their food without chewing, organic chickens like ours eat both grain and whatever they forage in the fields, so they need a little help. Long story short, hens do have teeth (but they're rocks), and they keep them in their stomachs (not their mouths). Chickens use their beaks to pick up food which gets stored in a large sack called the crop. It then gets moved along to the proventriculus which produces digestive enzymes that start to break it down. The food and enzymes then move along to the gizzard, and it's here that more fibrous material such as grass gets broken down. The gizzard is just a really strong muscle though, and it relies on grit, stones and small rocks that the bird has eaten when foraging to grind the food into small enough particles to be absorbed later in the intestines. While they may well get the grit that they need simply by foraging in the fields, it's really important that younger birds have access to plenty of grit as it's essential for the development of a healthy gizzard. 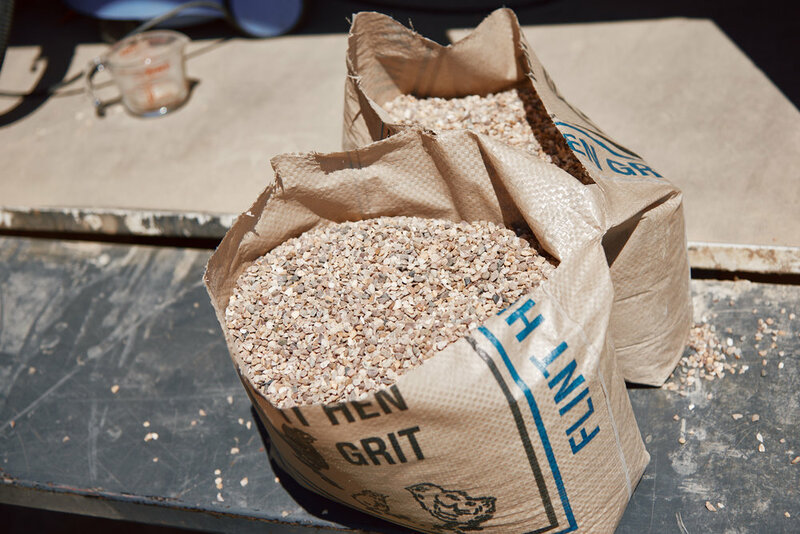 So, while it may seem strange, we regularly add a little Flint Hen Grit to their feed to keep their digestive systems in a good, healthy condition.